Our attorneys offer a broad range of services focused on meeting the needs of our clients and the individual demands of every case. 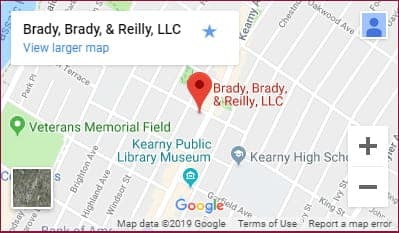 At Brady, Brady & Reilly, LLC, in Kearny, New Jersey, we take a comprehensive and strategic approach, focused on achieving results with minimal time, cost and impact. You can trust that we will remain available to answer your questions, address your concerns and work through any complications that may arise. Our legal team is experienced in the investigation and pursuit of claims involving medical malpractice and serious injury arising out of nurse, hospital and doctor negligence. Understanding the often complicated nature of these claims, we are prepared to fight for your interests and work toward an effective resolution. In addition to our personal injury practice, our lawyers represent clients in municipal court cases arising out of DWI, DUI, reckless driving and other offenses. Although people who work in dangerous occupations such as construction may have higher rates of injury, not every unsafe work environment is so obvious. Our personal injury team is dedicated to providing quality service and advocacy in complex claims. We work to recover maximum compensation so that you and your family can move forward with the financial security you need and deserve. We represent workers and families affected by complex construction accident claims. Our priority is to help you recover for pain and suffering, lost wages, long-term care needs, medical expenses and any other losses you have endured. Attorneys from our firm routinely handle injury and wrongful death claims arising out of motor vehicle accidents. Our Kearny car accident attorneys are experienced in cases involving car accidents, motor vehicle accidents, truck accidents and drunk driving accidents. Free consultations · Evening, hospital and in-house visits · Spanish and Portuguese language services available · Se habla español · Call (201) 997-0030 or contact us by e-mail to arrange a case evaluation directly with a North Arlington truck accident attorney.